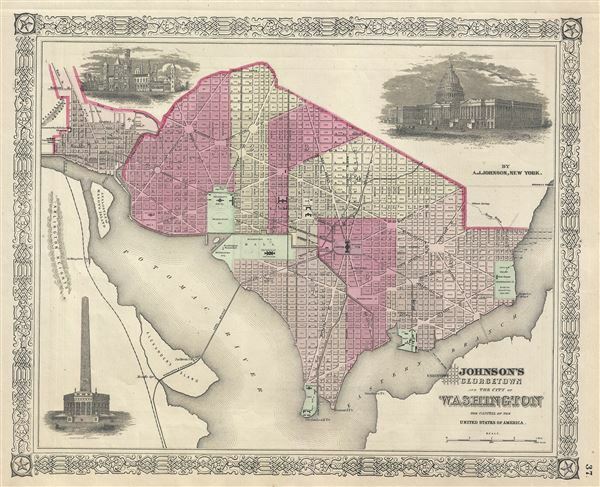 1866 Johnson Map of Georgetown and Washington D.C.
Johnson's Georgetown and the City of Washington The Capital of the United States of America. This is a beautiful example of A. J. Johnson's 1866 map of Washington D.C. and Georgetown. It offers a fascinating snapshot of the nation's capital shortly after the close of the American Civil War. Shows the city in considerable detail with color coding according to ward. Notes numerous important buildings including the Capitol, the Smithsonian Institution, the White House (not yet called the White House), the Washington Monument, the National Observatory, the Navel Yard, the Poor House, the City Hall, and others. Shows the grid and ray structure according to L'Enfant's brilliant plan. Georgetown appears as a separate entity in the upper left corner with Georgetown College noted just outside the city border. Also shows proposed landfills and extensions to the east side of the city into the east branch of the Potomac River. Though ostensibly based on Colton's map of Washington D.C. published in 1855, Johnson add a number of updates and embellishments including three engraved views. The grand dome of the Capitol Building, shown complete in the upper right hand quadrant of this map, was only partially complete when this map was issued. The Washington Monument appears in an earlier unrealized conceptualization in the lower left quadrant. The Smithsonian Institution, now the nation's largest museum, is pictured in the upper left quadrant. Features the fretwork style border common to Johnson's atlas work from 1864 to 1869. Published by A. J. Johnson as plate number 37 in the 1866 edition of Johnson's New Illustrated Family Atlas. Johnson, A. J., Johnson's New Illustrated Family Atlas of The World with Physical Geography, and with Descriptions Geographical, Statistical, and Historic including The Latest Federal Census, A Geographical Index, and a Chronological History of the Civil War in America, 1866. Johnson's New Illustrated Family Atlas was produced in numerous editions from about 1860 to 1887. Johnson's first atlas was mostly likely the 1859 edition of Colton's General Atlas which both aesthetically and comprehensively very similar to the 1860 first edition of the New Illustrated Family Atlas. Johnson's atlas was noteworthy in its day as one of the few commercially produced American atlases that could compete with more established European Atlases. Although he called the atlas 'Steel Plate' on the title page for marketing purposes, Johnson in fact incorporated modern lithographic printing techniques and lower quality woven wood pulp paper to economically produce large format maps in quantity. He also began publishing the New Illustrated Family Atlas on the cusp of the American Civil War, a decision that proved fortuitous, as the war corresponded to a general increased interested in cartography. For the most part, Johnson's Atlas was sold by subscription; nonetheless it became so popular that for at time he was considered the largest publisher in the world. Other than the first edition, the atlas itself has no true editions. Rather, Johnson incorporated updated maps as they became available, so each example of the Johnson atlas might well contain unexpected and scarce individual maps. Johnson's map of the American Southwest, for example, appeared in more than 17 different states, each illustrating minor variations to the rapidly chasing geography of that region. Moreover, Johnson's offered a service whereby he would mail updated map pages that could be tipped into older atlases to keep them current. Generally speaking, Johnson's atlas was issued in four periods - each defined by a distinctive decorative border. The earliest edition featured a strapwork border that appears as rolled and decoratively cut leather. This borderwork remained in use until 1863. In 1864 Johnson started using an updated fretwork or grillwork border that resembles worked iron - as in a decorative fence. This border was in use from 1863 to 1869. The 1863 edition of Johnson's atlas used both borders and is considered transitional. From 1870 to 1882, Johnson introduced a new border that featured elaborate Spirograph style geometric designs, which was used from 1870 to 1882. After 1880 a new border different but aesthetically similar to the Spirograph border began appearing. Certain editions of the atlas issued from 1880 - 1882 were transitional. Very good. Minor overall toning and spotting at places. Verso repair extending upto 3 inches from bottom margin. Library of Congress, Map Division, G3850 1862 .J61. Rumsey 0535.025 (1862 edition). Philips (Atlases) 4345.